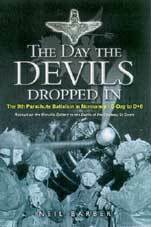 The 9th Parachute Battalion in Normandy - D-Day to D+6. The Merville Battery to the Chateau St Come. After listening to Neil Barber speak to us about this book at our last meeting I felt compelled to put aside the other books I have in the to read pile and get stuck in. The only worry I had was what I would do if I didnt enjoy it. What would I write? Happily, it wasnt a concern as Neils book really is an excellent read. How do you get a feel for what life was like for those dropped into enemy territory on the night of D-Day? The anxiety of the proceeding days, the chaos of the first night, the bloodshed and exhaustion of the following weeks events. Only those that were there can pass on this knowledge and often they only know their fragment of the events that took place. This book pulls together those fragments of personal accounts, official war records, documents and photographs to give the reader a complete picture of the events. Neil has painstakingly gone down every possible avenue of research, looking to every source of available information. The book is full of photographs of the people and places where the events took place which as well as giving it a very personal feel makes it a very visually pleasant and readable book. Once started I found myself unable to put the book down. An excellent book which I can thoroughly recommend. A web site about the book can be found at: www.mervillebattery.co.uk.